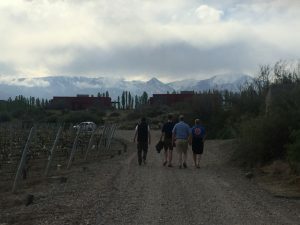 I have just returned from an amazing trip to Mendoza, Argentina’s most famous wine region. Stunning vineyards framed by magnificent mountains, consistently brilliant wines and inspirational people made for quite an experience (not to mention over consumption of beef and empanadas!). The region is most famous for its Malbec grape and I tried an amazing variety of styles but all with a common thread of freshness making, what can be a dense and weighty grape, more alive, vibrant and thrilling. However, Mendoza is not just Malbec! The other varietals I tried really stole the show for me. On the white side, Torrontes was crisp and floral with non of that soapy character common in so many. Susana Balbo’s Crios label stood out for it’s freshness, zip and sheer drinkability and is now available with us. Viognier made a showing at our visit to Atamisque under the Serbal label. It is a wonderful example with ripe stone fruit, lime citrus and red apple. It will be on by the glass in our Cargo branch closer to Christmas. The Chardonnay’s under both Catalpa and Atamisque labels are serious and complex. Beautiful in weight, ripe fruit and integrated oak. Bang for buck easily better than much of the offering from classic Chardonnay regions. For the reds, Cabernet Franc at every winery was astonishingly good. Great varietal character in each but eschewing that dominance of green notes for just a touch of herbs. We have one from Atamisque under the Serbal label. Cabernet Sauvignon also shone. Gorgeous ripe cassis, finely structured with well integrated tannin, yet firm enough for that charred steak (and they were so good with our daily Asados!). From Lorca winery, Poetica has some age and is showing lovely development. Crios from Susana Balbo offers more vibrant fruit and red crunch. Bonarda was the call of the day in a detour up to visit Cara Sur in Barreal, San Juan province. 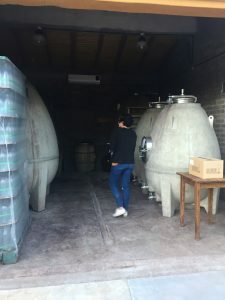 A tiny project from Sebastian and Marce Zuccardi and close friends Nuria and Pancho taking grapes from ancient vineyard plots and fermenting in concrete eggs in Nuria and Pancho’s garage. The result is the best Bonarda I have tried, chewy black fruits, herbaceous and pomegranate freshness. They also make an intriguing Moscatel Tinto in demijohns! Not like any other red I’ve tried with it’s exotic floral notes, you definitely need to give this a go. On our final day blends were the focus. We visited Bodegas Bengals with their ancient vines in impossibly beautiful vineyard settings. From this visit we have listed three of their blends going up in depth, complexity and price! Don Tiburico is 50% Malbec together with Cabernet Franc, Cabernet Sauvignon, Merlot and Petit Verdot and aged for 12 months in French oak. Red and black fruits are laced with vanilla, clove and cocoa. This will also be in by the glass in Cargo closer to Christmas. Finca Libertad is more or less equal parts Cabernet Sauvignon, Cabernet Franc and Merlot and aged for 18 months in French oak. It has a smoky, toasty note and ripe black cherry and red pepper. Dense, silky and long. Benegas Lynch Meritage is 50% Cabernet Sauvignon together with Cabernet Franc, Merlot and Petit Verdot, a selection of the best grapes, aged in barrel for 18 months and then 5 years in bottle. This is stunning. Powerful yet elegant, beautiful in structure, ripe cassis and plum, touch mint and incredible long finish. Overall this was the most incredible and informative trip for me and I hope we now have a selection of diverse, fascinating and ultimately utterly tasty wines for you to buy.